BULLET TRAIN (GB) (Bay 2007-Stud 2013). 2 wins-1 at 2, Lingfield Derby Trial S., Gr.3. Three-quarter-brother to SW Frankel. Sire of 188 rnrs, 81 wnrs, inc. SW Whiskey Train, SP Chapada, Madam Bullet, Egyptian Bullet and of You Know the One, Gun Bolt, Lacey Lynx Pack, Surprise Bullet, The Pinkerton, Extreme Thrill, Regal Cannon, Bullet Bandit, Fast Track Kathern, Ghost Train, Glory Train, Paris Mountain, Surely a Bullet, Triggerfish, Beirut, etc. At the Ready (g by Myboycharlie (Ire)) 6 wins from 1400m to 2200m, A$277,150, to 2017-18, Geraldton Cup, WATC Tabtouch H., Heineken 3 H., Perth Racing Young Membership H., 2d WATC Purslowe & Chipper Funeral H., Changing Lives H., Tabtouch H., D'Orsogna H., Pinjarra RC G Force Printing H., 3d WATC Swan River Vase P., Guinness H., Tabtouch H., 4th WATC Strickland S., Gr.3, Melvista S., L, Kalgoorlie Cup, L.
We're Ready (g by Lucky Owners (NZ)) 5 wins from 1350m to 1650m in Aust. 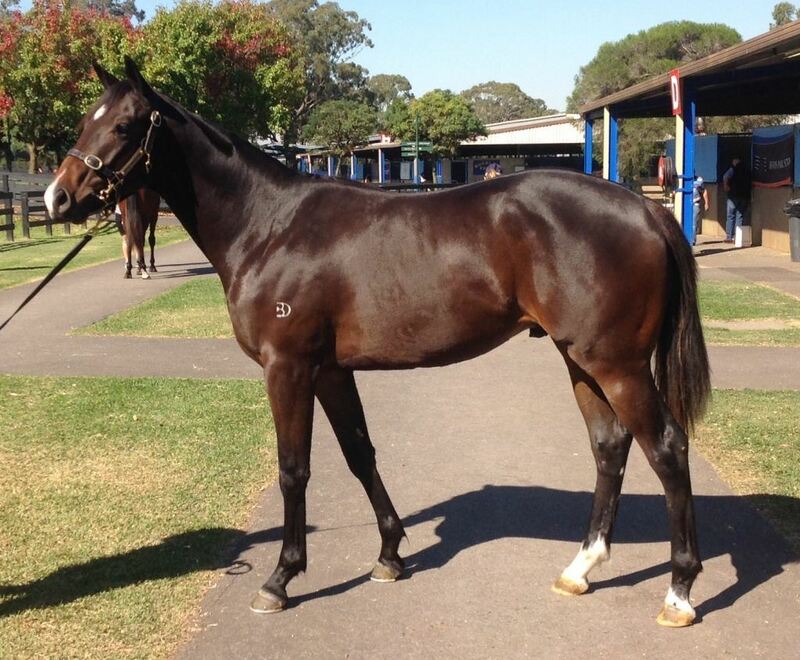 She's on Show (f by Champions Gallery (GB)) Placed at 3 in Aust. Detail (f Filante) 2 wins at 1000m, WATC Stylish Lord H., Lady Cass H., 2d WATC Belgravia S., L, 4th WATC Burgess Queen S., L. Producer. Rubin Sky. 10 wins to 1500m, A$178,747, WATC Perthracing.com.au H., Tabtouch Supporting Industry H., Silks H., 3d WATC Tabtouch.com.au H., Campari Cin Cin H., Imagesource Large Format Printing H.
PERFECT REFLECTION (f More Than Ready) 7 wins from 1200m to 2100m, A$1,401,950, WATC Kingston Town Classic, Gr.1, Lee Steere S., Gr.2, Ted Van Heemst S., Gr.2, Champion Fillies S., Gr.3, Belgravia S., L, Westspeed 3YO H., 3d WATC Railway S., Gr.1, Kingston Town Classic, Gr.1, VRC Vanity S., Gr.3, WATC Northerly S., Gr.3, 4th WATC Perth Cup, Gr.2. IDEAL IMAGE (f More Than Ready) 6 wins from 1000m to 1800m, A$434,400, WATC La Trice Classic, Gr.3, Burgess Queen S., L, Jungle Dawn Classic, L, 2d WATC Northerly S., Gr.3, Jungle Mist Classic, L, 3d WATC Champion Fillies S., Gr.3, RJ Peters S., Gr.3. NEW IMAGE (f More Than Ready) 6 wins-1 at 2-from 1000m to 2000m, A$255,400, WATC Belmont Oaks, L, Matchmaker Classic, L, Westspeed P., Playeronline.com.au H., 3d WATC Belmont Classic, L. Producer. ELUSIVE IMAGE (g Elusive Quality) 3 wins from 1200m to 2200m, A$168,025, WATC Belmont Classic, L, Westspeed 3YO H., 2d WATC Drainpave H., Golden Group H., 3d WATC D'Orsogna Champagne Ham H.
Grandstand (g Carry a Smile) 4 wins-1 at 2-at 1200m, 1650m, A$16,640, HK$2,379,725, WATC Blandford 2YO H., HKJC Phoenix H., Violet H., 2d WATC Sires' Produce S., Gr.3, 3d WATC Perth S., L, HKJC Cuckoo H.
FIGHTER JET (g Jetball) 11 wins from 1100m to 1700m, 1,051,212Rgt., S$58,124 in Malaysia, Penang TC Anniversary Cup, L, 2d Perak TC Coronation Cup, L, Perak Derby, L, 3d Perak TC Sultan Gold Vase, L.
STORMCAT ACADEMY (g Royal Academy) 10 wins to 1200m, A$243,550, Gosford RC Pacesetter S., L, QTC Champagne Kate H., AJC Glencore Country Cash H., STC Children's Hospital at Westmead H., 4th NSW Tatt's RC Carrington S., L.
FACILE TIGRE (g Catbird) 8 wins-2 at 2-at 1000m, 1200m, A$499,700, VRC MSS Security Sprint H., L, GCTC Ken Russell Memorial Classic, L, 2d MRC Oakleigh P., Gr.1, 3d MRC Oakleigh P., Gr.1, BRC Lightning H., L.